How Much Does the 2017 Dodge Grand Caravan Cost? How Many MPG Does the 2017 Dodge Grand Caravan Get? What’s New for the 2017 Dodge Grand Caravan? All the Grand Caravans come with 6.5-inch touchscreen radio and rear backup camera. It has an improved value at $24,995 MSRP. It adds more technology like a remote start and security alarm. There is a package called the Blacktop package that comes standard on the SE Plus and is now also available on the SXT. There are about 55 available safety, tech, and security features. Keep reading to find out more about the best-selling and most awarded minivan ever. All the trim levels for the Grand Caravan come with one engine. It is a 3.6-liter V6 engine. It can produce up to 283 horsepower and 260 pound-feet of torque. It comes with a six-speed automatic transmission. The fuel economy is combined at 20 miles-per-gallon with 17 mpg in the city and 25 mpg on the highway. The minivan comes with all-speed traction control that monitors for wheel slip. If the wheel slip happens, the system will apply brake pressure to the slipping wheel or wheels and may reduce engine power to maintain traction and stability. There is also electronic stability control that combines the anti-lock brake system and the all-speed traction control to give the minivan security and performance the driver expects. The Grand Caravan can tow up to 3,600 pounds when the Trailer Tow Group is added. The Grand Caravan fits seven-passengers. There are four trim levels: SE, SE Plus, SXT and GT. The SE has all the standard equipment like heated mirrors, steering wheel with audio controls, a conversation mirror, a second-row bench seat with the Stow ‘n Go fold-into-the-floor feature, and power locks, mirrors and front windows. The SE Plus comes with all the SE equipment plus upgraded upholstery and trim, a front floor console, second-row captain’s chairs with an additional floor console, and rear privacy glass. The SXT adds chrome exterior trim, foglights, automatic headlights, roof rails, power sliding rear doors, a power liftgate, remote engine start, a larger floor console, and leather upholstery with suede inserts. The top-level GT comes with a body-colored grille, a performance-tuned suspension, different wheels, black interior accents, a driver information center, a 115-volt household-style outlet, full leather seating, an eight-way power passenger seat, a 6.5-inch touchscreen display, a rearview camera, and an upgraded nine-speaker audio system. All the trims can add a DVD entertainment system. There is also a Blacktop appearance package with silver interior accents and a black grille, wheels, and leather interior. The 2017 Dodge Grand Caravan has been built on a strong but light body structure. Its interior is well-finished, and its exterior appearance is just stunning. If you would like you could get this vehicle with a rear-seat entertainment system to keep passengers in the back occupied on any long road trips. Drivers will enjoy the metallic rotary gear selector knob because of its luxury. There is open floor space between the driver and front passenger to ensure for more available storage space. The vehicle also offers bins, slots and cubbies to store things in. One can make use of folding/collapsible second-row captain’s chair seats, referred to by Dodge as “Stow ‘n Go.” The vehicle is essentially really upscale inside! 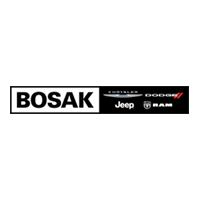 Check out the 2017 Dodge Grand Caravan at Bosak Motor Sales, located in Merrillville, Indiana, near Hammond and Gary. Call us for a test drive today.